As we are all well aware cars are great when they work and expensive when they don’t! We hand our vehicles off to (often) a complete stranger who behind closed doors works his “magic” and reveals a functional car and a hefty bill. If your anything like me, you wonder as you swipe your credit card, “what did he do that cost so much?” and “could I have done it myself?” Often the answer is “Yes, he didn’t do that much” and “No, you couldn’t do it by yourself hence the hefty price” but its sometimes the solution just requires enough bravery to look past that intimidation and see that your magical carriage is a simple easily understandable machine with simple easy to follow electronics! Take changing the headlight bulbs. Suggest DIY changing them and many would recoil in horror as if you suggested DIY heart surgery! HID origin wants to let you know that, in fact, it’s as easy to do as…. changing a light bulb! You wouldn’t call out an electrical to change a bulb in your home. If you did he would charge you £30 for the labor, £10 for parts and then add a call out charge! Expensive and unnecessary. The same goes for your car, especially with HID Xenon bulbs. Your dealership will charge you around £180 for a replacement HID Xenon bulb and £50 for labor, plus the hassle of making an appointment and taking it to the garage, it’s expensive, time consuming and unnecessary! 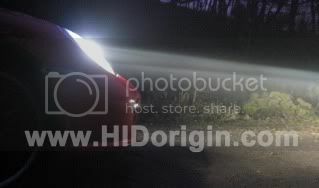 Why pay this when you could buy a genuine OEM lamp online at www.HIDOrigin.com, get next day delivery and fit it your self in less than half an hour! To demonstrate my point I was going to show you how I over came the intimidating Renault Laguna and do an application guide based on it but my brother-in-law chose an opportune time to visit in his 2010 Porsche Cayman S! 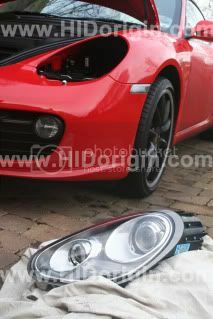 Although not all of us have a Porsche Cayman/Boxter the guide demonstrates how even the most expensive and DIY intimidating cars can quickly, easily and safely have new lights installed and the principals are the same for all cars and all lamps, often easier, Just give it a go! I’m sure you can figure it out. 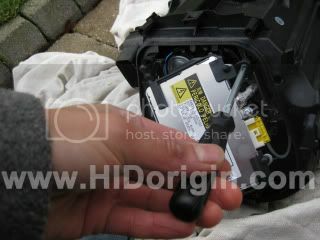 And if you can’t then simply contact HIDorigin.com and we will try our best to help. Anyway, to my brother-in-laws horror, let me talk you through it on a Porsche. Tools: You'll need a tool from the Porsche tool Kit that comes with the car. The kit in a Cayman S is located under the bonnet behind the back panel with your emergency tire sealant and air compressor. 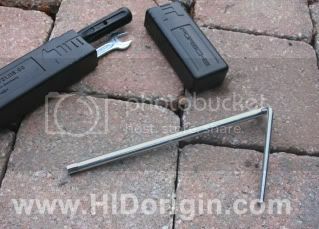 The tool you need is a hex socket with a fold out handle. 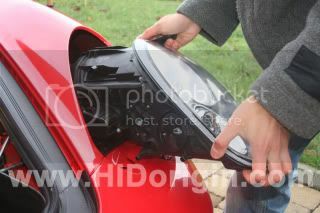 A) Removing the Headlamp Unit. 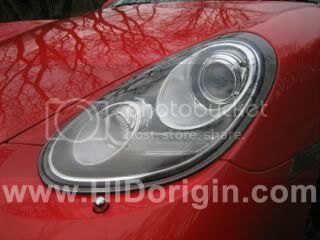 On the Cayman you'll need remove the entire headlamp unit (This wont be the case on most cars). It's one big piece containing the three bulbs and all of the reflection chambers. 1. 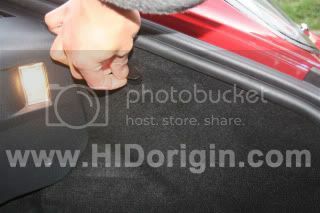 Pull back the trunk liner carpet. To do this, undo the plastic nut that holds the carpet to the side. Unscrew the nut while pulling, and eventually it will come off the threaded post. 2. 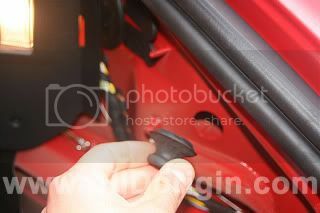 Remove the round rubber plug that covers the locking lever. 3. 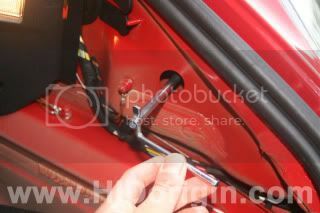 Insert the hex socket into the hole that was plugged by the round rubber plug until it “grabs” the hex head. Give it a 1/2 turn towards the back of the car. You should hear a definate click or snap and the headlamp will pop out about a 5mm or so. Don’t be alarmed! What's happening is you are turning the locking lever, releasing the headlamp. 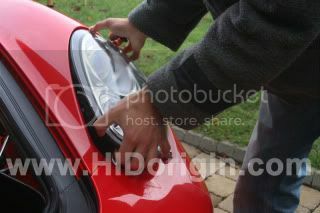 Leave the hex socket tool in this position until you are ready to lock the headlamp in place at the end. 4. 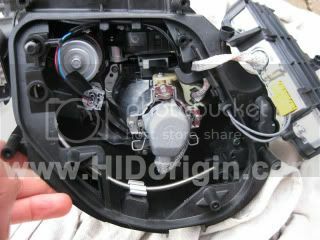 Pull the headlamp unit straight out of the housing. It should slide straight out fairly easily. You may have to wriggle it side-to-side as you pull, but if it's stuck you probably did not unlock the locking lever completely. 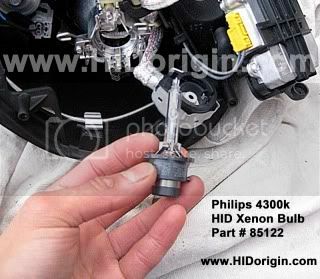 Tip: You can move the headlamp unit to a convenient place to swap out the bulb. I put mine on a soft blanket so it wouldn’t get scratched. 2. 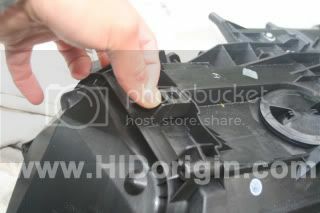 Unscrew the four screws holding on the rear panel and unclip the clips on the top and bottom removing the cover and exposing the ballast. 3. Unscrew the three screws holding the ballast reveling the electrical connector. 4. Pull the electrical connector off the lamp by twisting anticlockwise and pulling. 5. Unlatch the wire latch that holds the Xenon bulb. Now the bulb is free and can be easily removed/replaced. Don't worry about the bulb orientation—there's only one way it goes in. 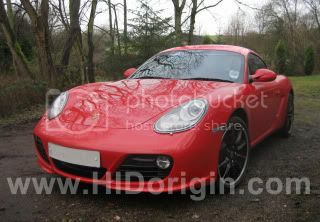 The Cayman takes a Philips D2S 4300k as OEM. 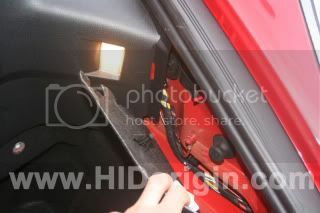 HID origin is proud to say that we offer this part that retail at over £100 on the high street at prices only found on ebay but with all the guarantees, warranties and after service of a professional business. 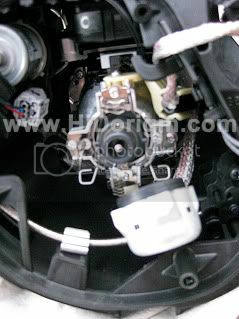 After refitting the Headlamp unit and turning the hex socket tool ½ a turn towards the front of the car you should hear a definite click or snap. Use this to indicate the headlamp is secure and double check by looking to see if the unit is pulled in flush against the car. FINALLY: Test it and see if the lights all work! Warning: Xenon Gas Discharge Lamps and HID Xenon Conversion Kits operate under high voltages and therefore there is risk of electric shock. Extreme care should be taken.